This will be my Happy New Year post. Thank you to the team at Wicked Wednesday for embracing me and my art so warmly in the short time I've been playing at their challenge. This is a digi from Dilly Bean Stamps, Megan's art captured my heart from the moment I saw her work, lots of cute and quirky personalities. 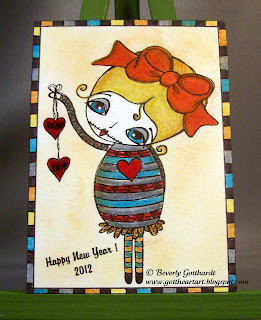 I printed her on watercolor paper, colored with Stampin' Up markers, chalked around her for some softening, and a little bit of glaze pen on the hearts for shine. To all the Team's that I have played on their challenges this year THANK YOU, THANK YOU, for giving all we budding artist's a place to stretch our artistic wings and display our creations. I have a lot of successes and met a lot of my goals in 2011. I'm looking forward to 2012 with much anticipation. I don't write down new year's resolutions, but I do make some silent goals in my mind and heart and strive to achieve them to the best of my ability, if a few don't get accomplished that's o.k. because I have given my best efforts. Stiffen your backbone, hold your head up straight, look forward, and keep steppin'. She lived to be 95, still living by herself and driving. A woman born in 1901, strong and gritty to the end. I wish you all Peace and Love and many successes in the coming year. Hi there Beverly! I am so happy that you joined us at Wicked Wednesday. You have offered countless positive reinforcement and you are another great source of inspiration for me. Each week, I look forward to your creations. HAPPY AND HEALTHY NEW YEAR!!!! Beverly just love what you have done with this cute Dilly Beans image!!!! Thanks again for joining in at Wicked Wednesday!! !